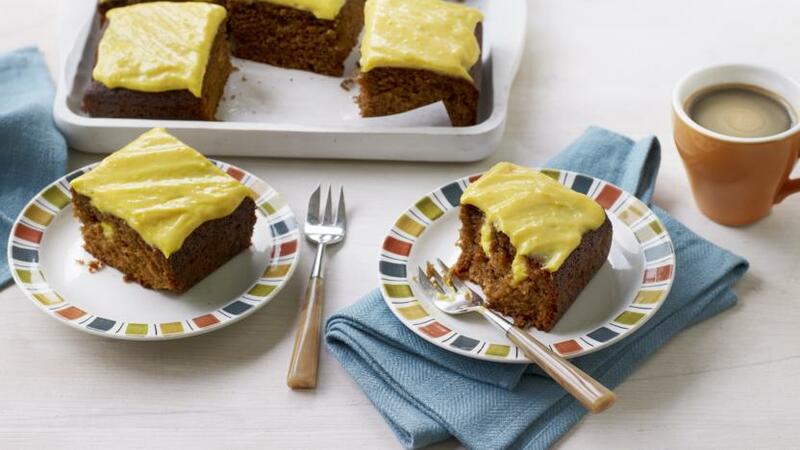 This delicious moist coffee cake has holes deliberately poked in it after baking, and a thick tangy orange curd drizzled into them. Preheat the oven to 180C /160C Fan/Gas 4. Grease the base and sides of a square 23cm/9in cake tin and line with baking paper. Put the oil and sugar into a bowl and mix well. Add the eggs and whisk in well, then stir in the coffee mixture. Add the flour and baking powder and mix until you have a smooth batter. Pour the mixture into the prepared tin and bake for 50 minutes to 1 hour. The cake is ready when a skewer inserted comes out clean. Take the cake out of the oven and leave it to cool in the tin. Then, using the handle of a wooden spoon, poke holes evenly across the cake. You need 36 holes – about 4 holes per portion – this sounds very exact but there should be an equal measure of pokes per person. However, be sure not to poke the holes all the way down to the base of the cake, or the curd may seep out. To make the curd, put the egg yolks, orange zest and juice, sugar, butter and cornflour into a pan and whisk it all together until combined. Pop on a low to medium heat, whisking all the time until the mixture thickens. It’s ready when the curd coats the back of a spoon. Put the curd into a bowl and leave it to cool completely in the fridge. Once the cake has cooled, take it out of the tin and put it on a serving dish or cake stand. Put the cold curd into a piping bag and pipe it into the holes. When all the holes are filled, use the rest of the curd to cover the top of the cake. Serve in slices.